I attended the Nottingham Green Festival at The Arboretum today. 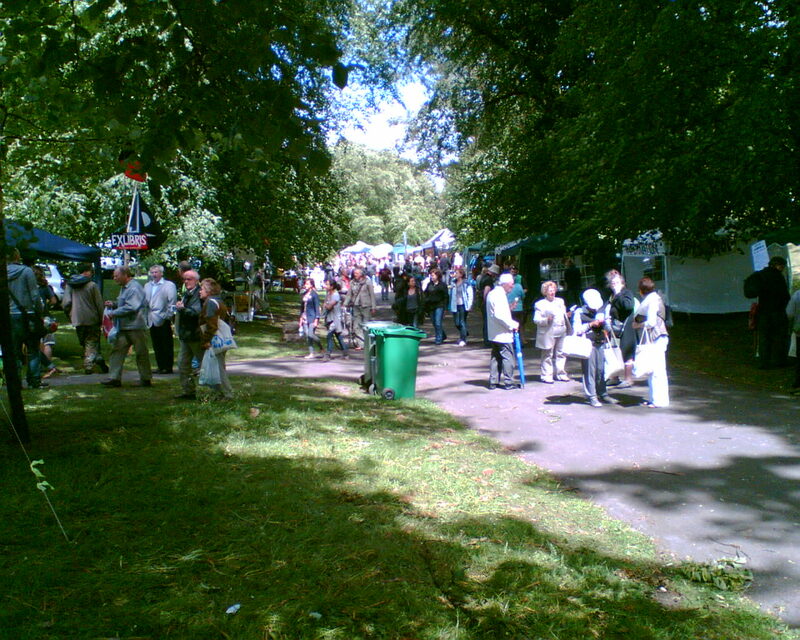 It is described in the Organiser's website, "Nottingham's only green event now running annually for over two decades, is the event that brings everything that is wholesome and healthy for you and the planet to the people of Nottingham and beyond. Representing to many health and happiness, and lots of family fun, and the start of the summer season. 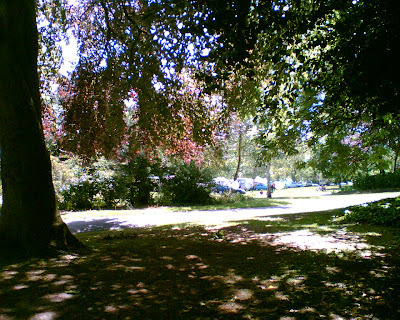 With our environment and changing weather on everyone's lips, our own green festival is the place for the whole family to learn, explore and try the latest in everything environmentally friendly and ethical, whilst also having lots of fun in the beautiful setting of the Arboretum Park. 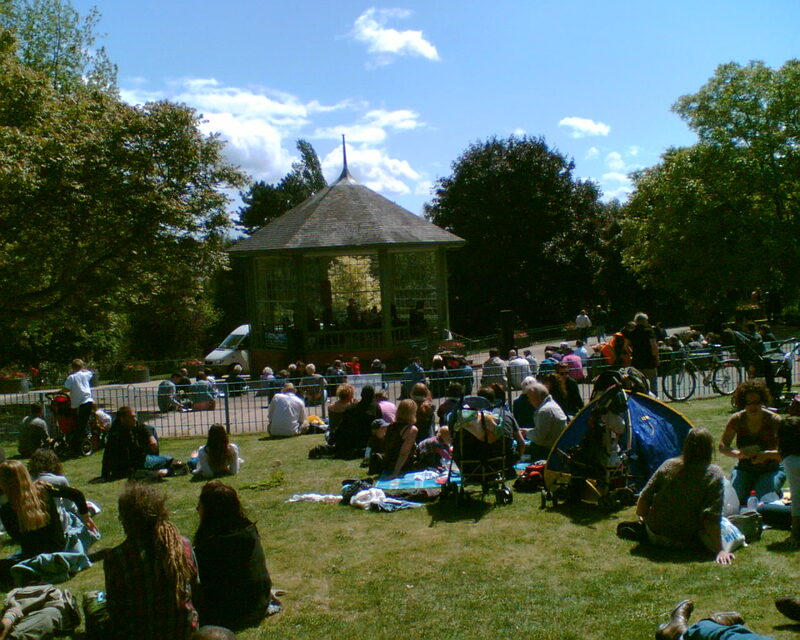 This event has over 100 product, information and food stalls, kids rides, workshops, alternative therapies and technologies, live performers, entertainments throughout the park, live music bands performing from the bandstand, and Veggies Catering nearby". How did the Festival live up to its billing? 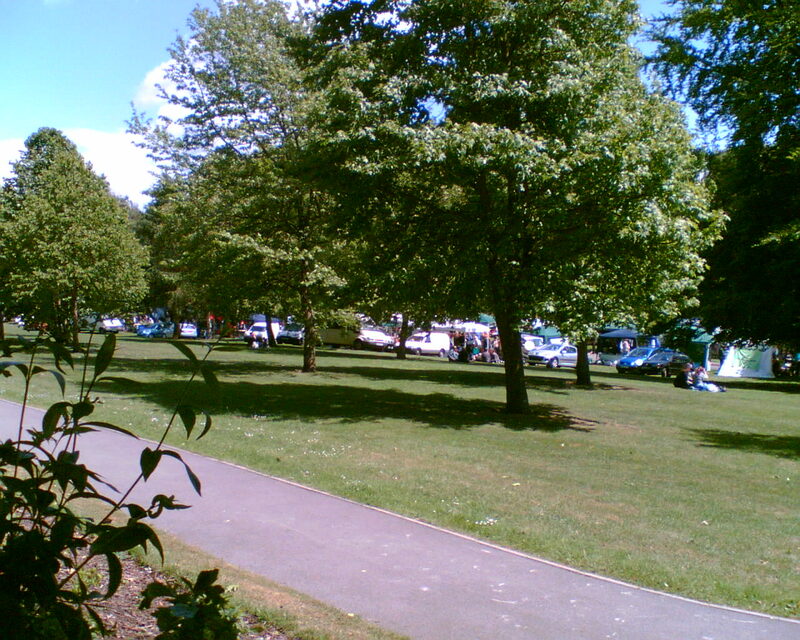 Though windy, it was a beautiful sunny day, and thousands were out in the park, viewing the stalls, and with families and groups enjoying picnics. 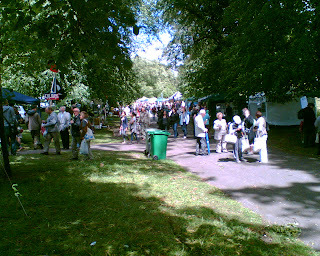 The range of stalls certainly catered for everything that was "wholesome and healthy". There was the all embracing Greenpeace, to the small and local protection of the hedgehog. Animal welfare was side by side with human welfare. 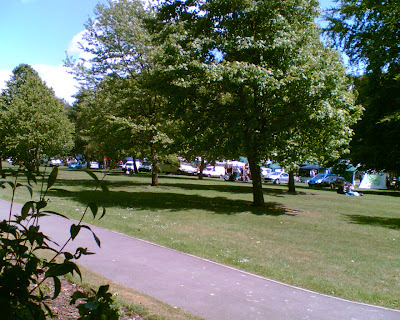 Plants and food sourced locally were being sold at fairly reasonable prices. A small book stall, with profits going to charity, was asking you to give more than the small asking price. Not a bad marketing ploy that. Alternative sources of energy were on display, particularly solar panels. Alternative therapies also had a stall, providing Massage and Reiki. Some strange (to me) massage techniques were taking place on tables outside of the tent, in full view of everyone. Now, I like a massage, but not in full view of thousands of people passing by. (I must have had a sheltered upbringing). The juxtaposition of two stalls really interested me. The Socialist Workers Party were calling on the TUC to organise a national strike against the cuts, and for us all to engage in a "Day of Rage". Directly opposite this stall was one being run by the Buddhist Community, who advocate anything but rage. I guess that you could get angry in one, and be calmed down by the other. Or perhaps you could visit the one to be calmed before a visit to the other, and there would be less inclination to rage. However, neither stall seemed to be doing much business. Please don't think that I'm mocking here, because I'm not; it just made me smile. (I have been told that occasionally my smile looks like a sneer, and makes me appear a bit sinister. I don't believe that of course, but just in case it's true, I don't mean it, as sinister is not part of my makeup, and I've just realised that I'm finding it difficult to get out of this parenthesis, now where is that door?). ﻿ There were a number of food outlets designed for healthy eating, though I'm not totally sure that chips fits in to that bracket, although in moderation of course they can be very nice. There was lots of things for children to do which was great. There was a very large blown up slide, tug of war and exercise fun with parachute canvas. One display had me a bit confused, as there were about 20 people in identical tee shirts standing around in a circle, clapping their hands, with some of them doing a kind of chant. Two of the number were in the centre of the circle doing what looked like dance to martial arts moves. I have to say, that though I was slightly confused, the performance was very beautiful, and the dance extremely graceful. 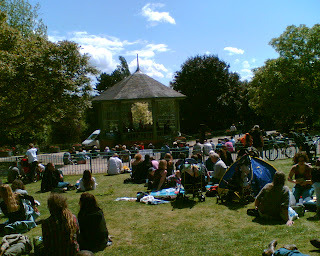 There was also music performed all afternoon from the bandstand. Five groups seemed to be allowed 45 minute sets, and I was thrilled to see that the first set was being performed by a jazz group. I sat in the sunshine enthralled by their performance (sorry, but I couldn't see their name). The following groups seemed to be a mixture of Reggae and Hip hop, but thankfully it was time for me to go. After all you can only have so much fun in an afternoon. In all, it was a great day, and a great event, held in a fabulous setting, and I expect that we were all very glad of the sunshine.